Hamilton, ON, April 3, 2017. The jury has reached its decision: After several days of assessing thousands of products from all over the world, Hamilton’s very own Nix Pro Color Sensor received the “Red Dot” distinction. 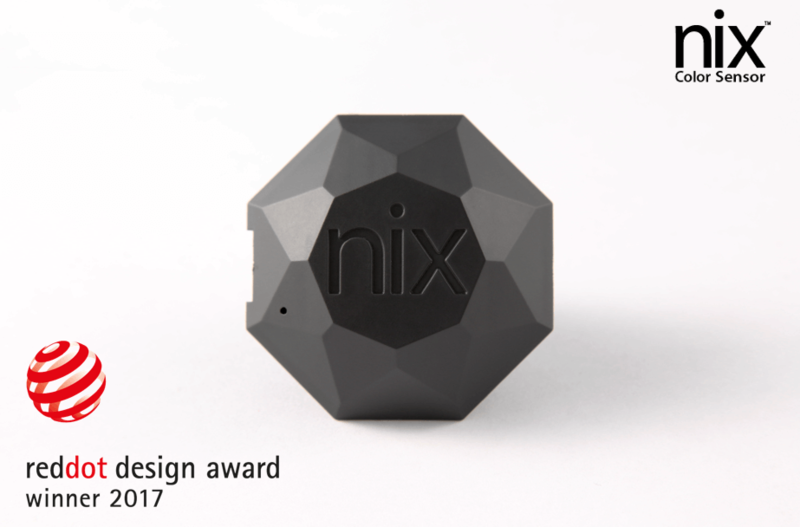 Nix Sensor Ltd. created an outstanding design that the expert committee for the Red Dot Award: Product Design 2017 has recognized with the internationally sought-after seal of quality. The Nix Pro Color Sensor was designed and built in Hamilton, Ontario by technology company, Nix Sensor Ltd. The Nix Pro is a handheld color sensor that provides accurate color measurement of any surface it is placed on and sends the color data to the accompanying smartphone application. Once a color is scanned, users can match to more than 12,000 colors in the application’s library. Its unique and patented shape blocks out all ambient light, which allows for its industry leading accuracy. The significance of the international design competition, Red Dot Award: Product Design, with its headquarter in Essen, Germany is well established internationally. It was more than 60 years ago, that a jury convened for the first time to assess the best designs of the day. Since then, an expert team has been awarding the seal of quality for good design and innovation to the outstanding designs of the year. The Red Dot Award: Product Design 2017 will culminate in Essen on July 3, 2017. This is when the Red Dot: Best of the Best laureates receive their trophies during the Red Dot Gala award ceremony. At the subsequent Designers’ Night after-show party, the award winners will celebrate in the midst of all the prize-winning products in the Red Dot Design Museum Essen, and the Red Dot winners will receive their well-earned certificates. For five weeks, the special exhibition “Design on Stage” will present the awarded products of the year as part of the world’s largest exhibition of contemporary design. Marketing Coordinator, Nix Sensor Ltd.